When you’re watching your calorie intake and exercising regularly, it’s safe to lose about two pounds a week. 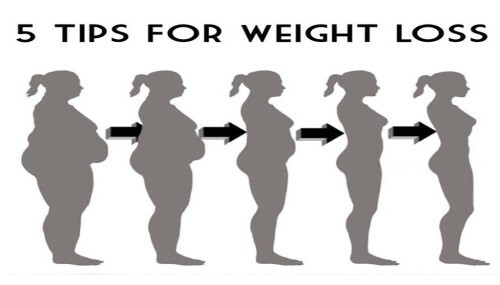 That may not seem like much, but over time, those little bits of weight loss will add up. You didn’t gain all that weight overnight, so don’t expect to lose it that quickly, either. Sure, your ultimate goal might be to fit into the jeans you wore in college, but in order to stay motivated, you need to set mini goals along the way. Every Sunday night, decide what your goal will be—to work out three times that week, eat greens every day, or meet with a personal trainer. Then when you reach your goal, reward yourself in a healthy way with a new water bottle or a trip to the movies—anything that makes you feel like you accomplished something. Since your weight-loss journey is made up of small steps along the way, it’s important to track your progress. Seeing how your efforts are working will definitely inspire you to keep it up. Keep in mind that progress can be made in other ways that don’t involve a scale—like having more muscle tonnage or extra energy. So you ate healthy all week but didn’t lose any weight—what gives? Unless you write down every bite you take, it’s easier to cheat and grab a cookie here and some fries there. Those handfuls add up, and if you write down your food intake, you’ll better understand why the scale isn’t budging. It will also keep you honest. You’ll be less likely to devour two pieces of cake at your friend’s birthday party if you know you’ll have to write it down later. To keep you even more accountable, share your food journal with a friend. The support of your friends and family is huge when it comes to staying motivated. Tell everyone who’s close to you that you’re trying to lose weight so they can help you stay on track (instead of calling you up to go out for ice cream). Set up fitness dates, share healthy recipes, and have a reliable friend you can count on to call when you feel like you’re veering off course.